Celebration campervan hire - Wanderlust Camper Co.
or you simply want a get together with a difference - we have the answer! Hire our campervans together for a unique celebration with friends. We've teamed up with 6 fabulous local venues offering unique experiences and activities. when you stay on stunning grounds in one of our campervans. All you need to do is choose your activity, decide whether to take Sally, Lula or Amelia - or all 3, pitch up and you're close to the action. These amazing workshops and culinary treats can visit you at either the venues above, or your venue choice, bringing with them their mobile workshop and culinary experiences. Get crafty creating silverware, mosaics or pottery, or we can arrange for a vintage tea party, BBQ or summer menu to be brought to you. Take a look at the 6 venues we've chosen to team up with based in and around Gloucestershire, Herefordshire, Worcestershire and the Forest of Dean. Choose from fun activities, brewery tours, cookery lessons, fishing, horse-riding, afternoon tea, dine in style with a themed supper club or simply a place to relax. ​Let the fun come to you with our mobile experiences! With your venue selected (within our region) add to your party by choosing one of these creative workshops ​or culinary experience. These lovely options will bring their fabulousness out on the road to you. This is a truly therapeutic beginners’ session to give you a taste of working with silver. A 2-hour session learning skills such as filing, stamping, texturing, sanding, shaping, drilling and polishing. Practice your techniques on aluminium or copper and then design and create your own piece of silver jewellery to take home with you! ​Prices: £60/head for a group size of 5+, £70/head for a group up to 5. Maximum Number in groups 8 or 12 – depending on venue. Rachel’s workshops are inclusive for all ages and perfect to inspire you and your friends. Delivered in Rachel’s studio, or at your location. Learn how to make a mosaic heart with all the materials and guidance you need included. 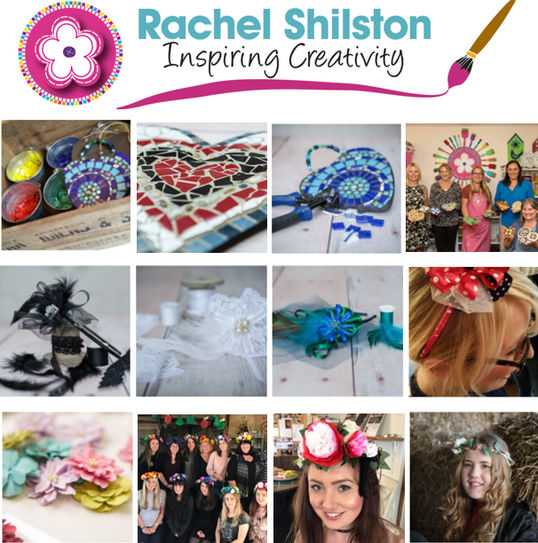 Rachel also offers Fabulous Fascinators, Wine Glass Painting and Flower Crowns workshops to provide some great choices of creativity! ​Prices: £30/head for 10+, £40/head for a group of 6-9. 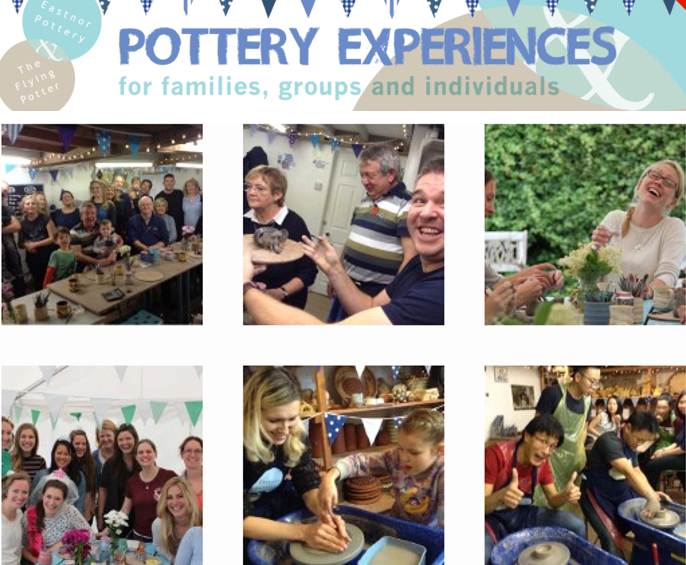 Create at Eastnor Pottery studio or The Flying Potter at your venue with some great options. Clay modelling and potter’s wheel projects are especially designed for large groups and special occasions. Make pots on the potter’s wheel, create clay sculpture and personalised arty-facts. Suitable for groups of all ages and family gatherings. ​Prices: £15/head for a group size of 6+, Maximum Number in groups 6-30 – depending on venue. Or a menu of your choice. Delicious cream teas and afternoon teas - with lemon drizzle, Victoria sponge, fairy cakes and finger sandwiches - served on pretty fine vintage china. Perfect for a family gathering, celebration or special treat. China Melody will deliver their gorgeous cakes and china to you at your location so you can enjoy afternoon tea on location. ​Prices: from £12/head for a group size of 6-12– plus a delivery charge depending on location. Totallytents provide ‘Oxford Canvas’ traditional bell tents for our camping guests, with four metre bell tent for up to 3 guests or a five metre bell tent for up to 6 guests depending on your accommodation needs. Individual and stylish handcrafted campervan hire. Unique campervans available to hire from Gloucestershire, straddling the Herefordshire & Worcestershire border. ​ Ideal for exploring the three counties, the Forest of Dean, Malverns, Brecon Beacons, Gower & Cotswolds. You are welcome to take our campervans around the UK.